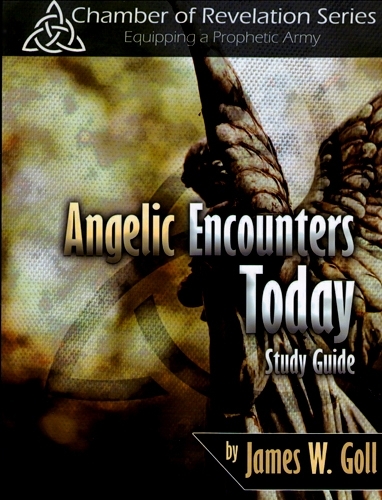 This Angelic Encounters Study Guide is part of the Chamber of Revelation Series: Equipping a Prophetic Army and complements James W. And Michal Ann Goll’s book Angelic Encounters. Did you know that you typically have a lot more angelic company than you realize? Your prayers release God’s power and God often sends angels to bring His powerful response. Angels were at work throughout the Old and New Testaments and they are still at work today! 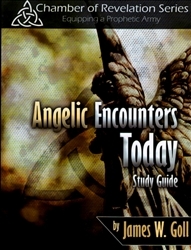 James and Michal Ann use Scripture, church history, testimonies, and personal experience to: describe the different categories of angels, explain angels’ ministry as God’s agents to the world, demonstrate how intercession and angelic ministry are related, and show you how to perceive and engage angels in your own life. This study guide is great for individual study in your own home, with a small group, or in a classroom setting. It also serves as part of the core curriculum for a course by the same title in our God Encounters Training – eSchool of the Heart. At the end of each detailed lesson are simple questions for your reflection and review. As you work through these lessons and put them into practice, you will better understand the function and ministry of angels. Preface: We are Not Alone! James W. Goll is the President of Encounters Network, the Director of Prayer Storm, and the Director of God Encounters Training – an eSchool of the Heart. He is a member of the Harvest International Ministries apostolic team and an instructor in the Wagner Leadership Institute. With great joy James has shared Jesus in more than 50 nations teaching and imparting the power of intercession, prophetic ministry, and life in the Spirit. James is the prolific author of numerous books and has also produced multiple corresponding study guides. James and Michal Ann were married for 32 years before her graduation to heaven in the fall of 2008. James has four adult children who all love Jesus: Justin, GraceAnn, Tyler, and Rachel; and he makes his home in the rolling hills of Franklin, TN.